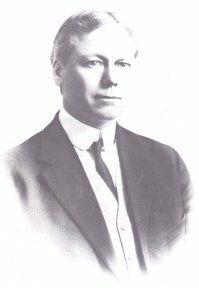 Lewis Hobart Sweetser was born in San Francisco on January 13, 1868. 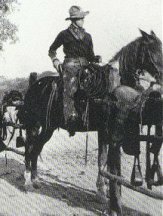 His father, Andrew Sweetser ran a prosperous California farming and ranching operation and went on to become one of the early cattle ranchers in Idaho's Cassia County. 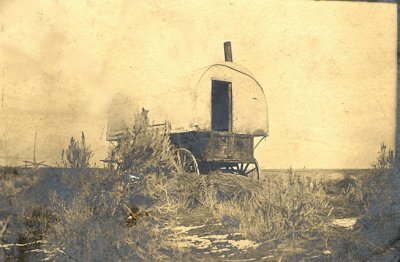 In the 1860s he and his partner, J. Q. Shirley brought a herd of cattle from California and soon became very successful cattle barons in the Raft River valley in an area close to present-day Malta. 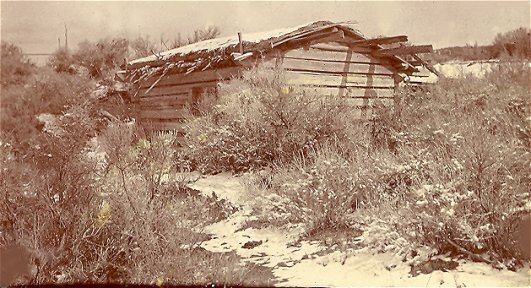 Young Lew and the rest of the Sweetser family resettled to this southern Idaho region in 1871, where they lived in a log cabin in their remote ranch for over three years. 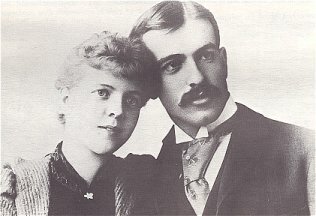 Eventually Shirley was replaced by James Pierce and Andrew's brother, John, to become the "Sweetser Brothers and Pierce." 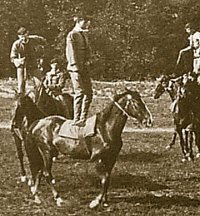 Lewis returned to California for his schooling in San Francisco's Urban School followed by one year at the University of California at Berkeley. He then enrolled in the Sheffield Scientific School at Yale, where he met the older brothers of Edgar Rice Burroughs -- George and Harry Burroughs of Chicago. He and the Burroughs boys became fast friends and were successful in their college courses and athletics -- participating in rowing, boxing, wrestling and track. The Burroughs Brothers: Harry and George T. Jr.
May 26, 1887: I have several times been on the point of telling you that I would not go out with Sweetser but thought I would wait until you mentioned the only as there was no hurry, then your letters speaking of sending me to Tacoma made me think that if you wanted me to go out then I might make "Cal" a visit on the way. I will let him know as soon as he comes back from Harvard, where he has been since I rec'd your letter, that I wont be able to go with him, and will be ready to go to work as soon as I get home. June 13, 1887: [FROM HARRY TO MOTHER]: As our recitations cease to-day 3.30 P.M. I celebrated by taking a ride with Lou Sweetser yesterday and so was unable to write at the usual time. We left here about 9.30 A.M. for Waterbury; the land of nickel matches and also, as we observed while there, of pretty damsels (compared with "New Haven") . . .
April 8, 1888: I was in New York last Wed. I went down with Sweetser who was entered in an amateur wrestling contest, it was a private affair & took place in the gym of the New York Athletic Club. The managers were so pleasant to have an entry from Yale that they showed us every consideration & treated us although we were somebody. April 22, 1888: We are at a training table, as Harry has probably told you, and are rowing pretty hard, from five to eight miles a day. The race comes off on Sat. May 12 & after that I think I will still keep in training & box & wrestle with Sweetser who is anxious to get some one to wrestle with & will probably give me some pointers on sparring to get me to wrestle with him. June 27, 1888: Don't make too many preparations for receiving any of our friends. Owing to plans made by the parents of both they have been compelled to change theirs. Sweetser is going home today & Rice will probably not go through Chicago until after we get to Beaver Lake. 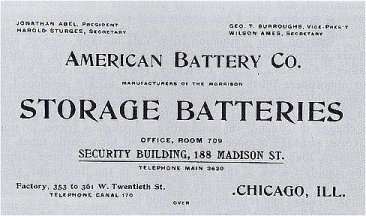 After graduation in 1889, Lew returned to the Sweetser Idaho ranch and the Burroughs brothers went to work at their father's American Battery Company in Chicago. Harry's desk job, in which he was surrounded by battery fumes, soon led to a serious lung condition and his doctor ordered a change of climate. 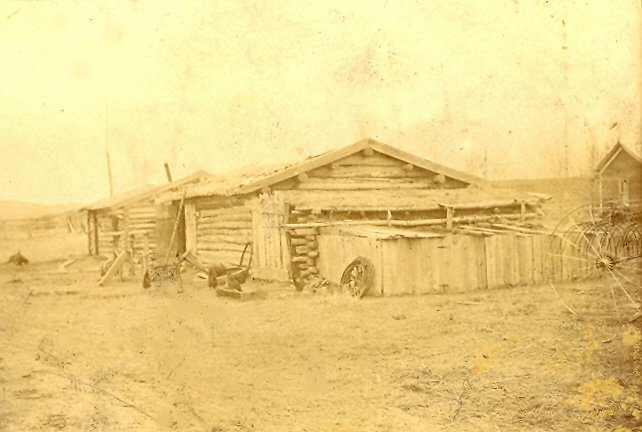 Major George and Lew Sweetser's father helped establish them in the ranch business. 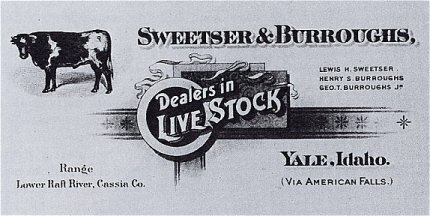 In August and later in October of 1890, "Sweetser and Burroughs" made purchases of two 320-acre holdings from "Sweetser Brothers and Pierce." 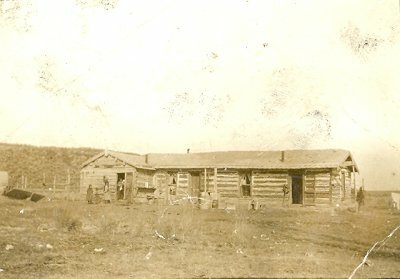 Soon George, Harry and Lew were working as cowpunchers on their ranch along the lower Raft River about 30 miles from the nearest railhead at American Falls. 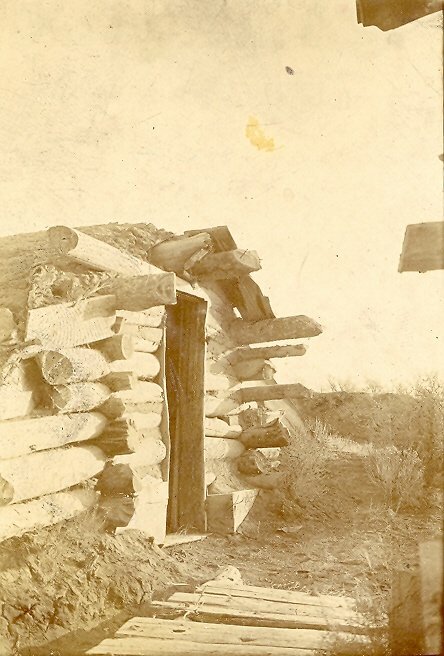 They named the ranch the Bar Y and were later given permission to establish a post office which they named Yale. Unfortunately summer drought and severe winters soon forced the trio to look for another venture to supplement their income. 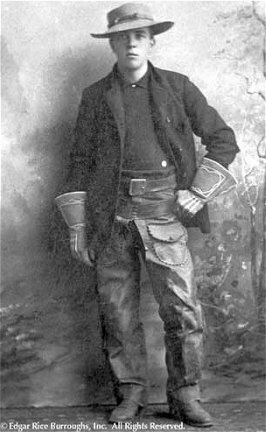 Their father, Major George T. Burroughs, sent fifteen-year-old Ed to join them in the spring of '91 and the young greenhorn experienced many adventures in the "wild west." He did ranch chores, rode the range, delivered mail and supplies from American Falls and developed a life-long love of horses and horsemanship. In the fall, Major Burroughs enrolled a reluctant Ed in Phillips Academy at Andover, but the exciting adventures he experienced were a profound maturing experience. George and Harry stayed in Idaho where they tried their hands at a variety of enterprises including gold dredging. They couldn't help but notice that the banks of the Snake River were home to many prospectors laboriously panning the river's sands for gold. The inefficiency of these small-time mining endeavours drew the attention of the Yale graduates and within three years they put their engineering backgrounds to work. They built a dredge -- the Argus --to mine gold ore from the Snake river bottom. They also built two houseboats to accompany the dredge -- the largest, called El Nido (the nest), provided living quarters for themselves and families and later a smaller one for offices and the dredge crew. The main houseboat was an elaborate affair that contained sixteen rooms, including one large common room. The Minidoka Museum displays a photo of this giant houseboat accompanied by a caption that reads: "IT WAS A BIG RIVER THEN . 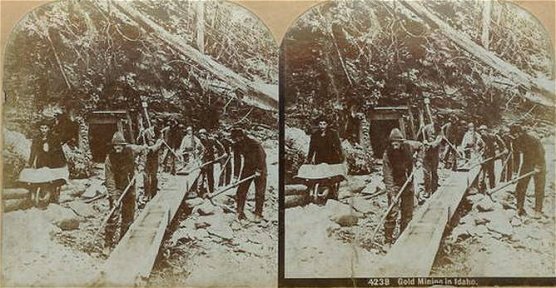 . . About 1890 Snake River provided a good living for gold dredge crews. The George Burroughs family lived in the upper level (five big rooms) of this houseboat, and the lower level was crew's quarters and office. The picture was taken near Yale where docks were installed. 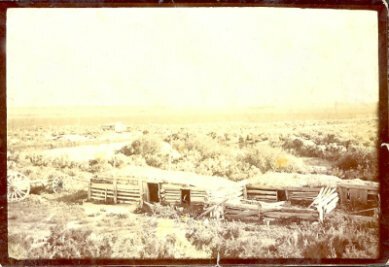 Burroughs' first location, in 1892, was at Raft River, from where he worked upstream. 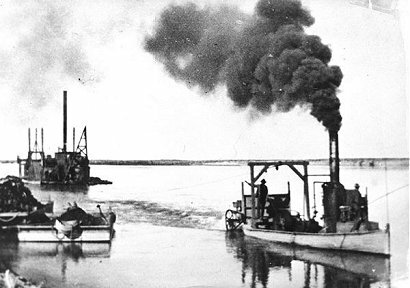 He took the dredge to Salmon after 1892 and worked it there. 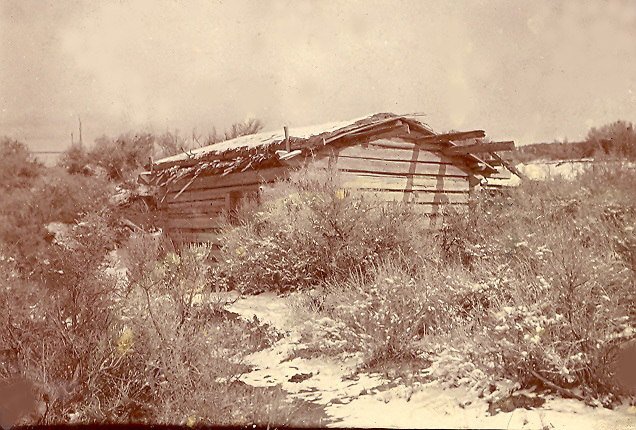 The houseboat was acquired by the Thad Ferrin family and they lived in it near Heyburn. 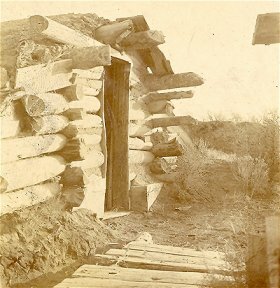 When the boat was dismantled, part of the timbers were used in construction of the "old" Heyburn bridge." Gathering in the lower parlor of the houseboat. Freda (Mrs. Walter) Sparks, Harry & Nellie's children Evelyn and Studley in foreground. George was president and manager of the mining operation. The operation soon became quite efficient and successful. A nozzle on dredge would vacuum up riverbed gravel and send it through shaking sluices to separate out the finer material which would be passed over burlap tables to capture sand and gold. Mercury was then used to separate the gold which would be melted and molded into bars. The gold was sent to Boise and the waste material was thrown back into the river in slag heaps. 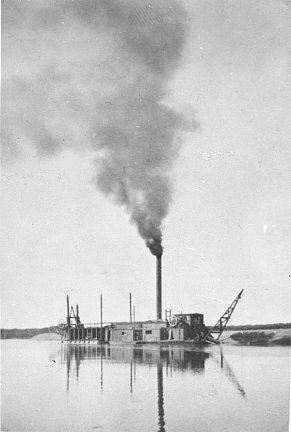 The operation was so successful that they built a second dredge -- the Yale, which scooped up the ore with conveyor buckets. The Yale was based on an unprofitable stretch of the Snake and the eventually the company started to run into financial problems. Idaho Daily Statesman ~ Tuesday Morning ~ April 20, 1899? The Only Plant for Working Snake River on a Large Scale That Has Proved Remunerative -- Works Two Hundred Yards an Hour. 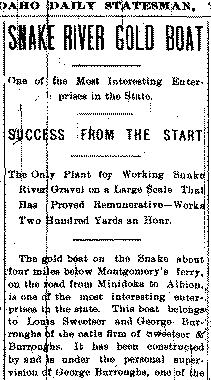 The gold boat on the Snake about four miles below Montgomery's ferry, on the road from Minidoka to Albion, is one of the most interesting enterprises in the state. This boat belongs to Louis Sweetser and George Burroughs of the firm of Sweetsor & Burroughs. 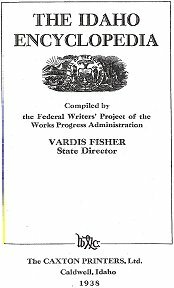 It has been constructed by and is under the personal supervision of George Burroughs, one of the owners. The boat is interesting both because of its machinery and because of the fact that it is the only successful contrivance for handling the Snake river gravel on a large scale. In no other instance has the Snake river gold been successfully saved when excessive operations were undertaken. This boat and its plant of machinery are the product of the genius and experience of Mr. Burroughs. He is a mechanical engineer and his training has been put to practical use in evolving this plant. Every feature of the enterprise is his own device, excepting that he utilizes the old burlap method for saving the precious metal. The boat is 105 feet long and 20 feet wide, the extreme length from the nose of the suction to the end of the tailings elevator being 150 feet long and 12 inches in diameter. The gravel is lifted by a rotary pump driven by a 75-horse power engine, the suction pipe being 50 feet long and 12 inches in diameter. There are two other engines, one of which is used to move the boat and the other to drive a scraper and elevator by which the coarse material is delivered at a point some distance back of the boat. Power is furnished by two 50-horse power boilers. The boat is worked backward and forward across the river, the nose of the suction being kept against the bank of gravel and the boat working up stream. Everything is taken up. The material is mostly ordinary gravel, but occasionally boulders come through, some of which weigh as much as 60 pounds each. The material thus mined from the bottom of the river is delivered into a sluice on board the boat. The upper end of the sluice is about six feet above the floor of the boat and the pitch is very steep. The sluice is 80 feet in length and 4 feet wide. The gravel is sent over ***grizzlies, all the coarse material being carried to the end of the sluice, where it is raked out by a series of steel scrapers, running on an endless chain and delivered upon a belt that carries it back of the boat and drops it again into the river. The sand carrying the gold drops upon burlap tables. Of these there are eight to each side. They are 15 feet long and 3 feet wide, standing at right angles to the sluice and reaching some distance over the sides of the boat. The black sand and gold gathers on and under the burlap. When the tables are cleaned up the concentrates are rocked over copper plates, the gold being amalgamated. The pump delivers 200 yards of gravel an hour. The boat has been built over three times. It has been a success from the start and during the past year it has been greatly enlarged. It would cost from $15,000 to $20,000 to duplicate the plant. The operating expenses are in the neighborhood of $20? a day. At present the boat works only during the day, but with a force of seven men it could be kept in operation throughout the 24 hours. Thirteen men are now engaged in gathering fuel. Some are hauling cedar while others are cutting and baling sagebrush. The latter makes the better fire but it costs a little more than the cedar. 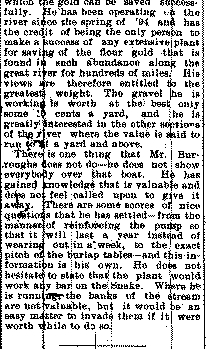 Mr. Burroughs says there is no other method than this burlap by which the gold can be saved successfully. He has been operating on the river since the spring of 94 and has the credit of being the only person to make a success of any extensive plant for saving of the flour gold that is found in such abundance along the great river for hundreds of miles. HIs views are therefore entitled to the greatest weight. The gravel he is working is worth at the best only some 10 cents a yard, and he is greatly interested in the other sections of the river where the value is said to run *** a yard and above. There is one thing that Mr. Burroughs does not do -- he does not show everybody over that boat. He has gained knowledge that is valuable and does not feel called upon to give it away. There are some source of nice questions that he has settled -- from the manner of reinforcing the pump so that it will last a year instead of wearing out in a week, to the exact pitch of the burlap tables -- and this information is his own. He does not hesitate to state that the plant would work any bar on the Snake. Where he is running the banks of the stream are not valuable, but it would be an easy matter to invade them if it were worth while to do so. Pocatello, Feb -- (Special) Lewis Sweetser returned from California today. He reports that no news has yet been heard from his father, A. T. Sweetser, who was carried out to sea by the tide in an open boat from San Francisco on November 27th last. Out of 40 vessels that left San Francisco harbor that day all but two have been heard from without any news of the missing man. Those two were sailing vessels bound for England and Mr. Sweetser is still confident that his father has been picked up by one of them and that he will be heard from safe and sound in a couple of months. My Grandfather and two of his cousins worked for these gentlemen on the Barge. I have a total of 19 original pictures that were taken in the early 1900's and are swiftly fading away. One of the pictures is of George, Edgar and nine other workers. The Lewis boys are my relatives. My Grandfather was David Lewis and I have not located him anywhere on a 1900 census. He got his leg caught in the dredge machinery and was crippled all his life. One leg was shorter than the other. He was just a few months older than Edgar. He knew Edgar so that narrows the timeline when he was working on the barge.  Danton Burroughs Tarzana Archives & ERB, Inc.